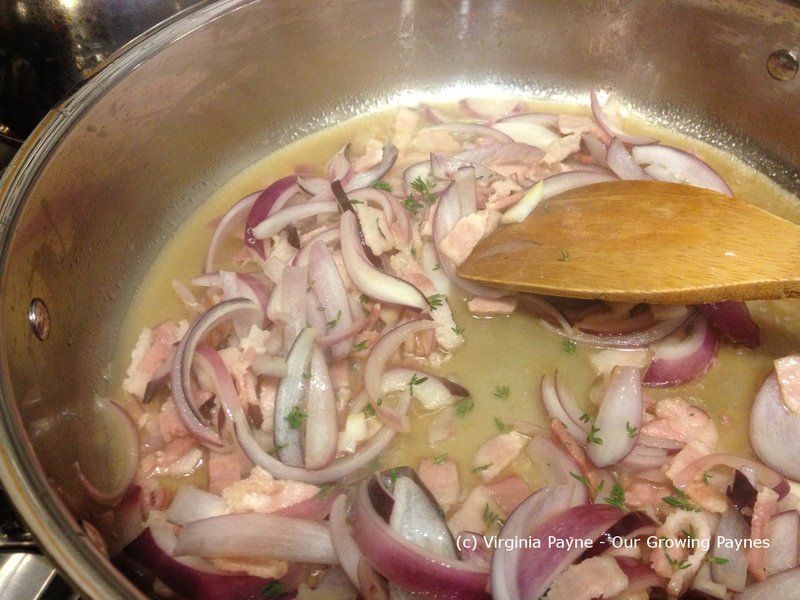 Tartiflette – And Can’t We Give Our Kids More Credit? She started the health course and her teacher in that class for some reason assumed none of the kids would have heard the word wellness before. I found this weird. The whole class had. But it made me wonder. Did she assume that the kids aren’t aware of the important things, or did another class space on this concept, or is it painfully obvious that a lot of adults around us aren’t taking the time with the kids on wellness. Part of the problem in general kids aren’t given enough credit. I think given half the chance most kids want to make the right choices and be well. We’re very lucky with our kids because they are aware of the importance of good food, exercise, positive choices equaling wellness. I doubt they are in a tiny minority though. I also think most kids are more than capable of grasping these concepts and to start a class saying this is a new word kind of dumbs it down. In continuing my pinterest theme of actually using the recipes I have found I decided to try a tartiflette which is a French potato dish. Kind of like mac n cheese but with potato only in a gourmet way. But meets the criteria of being a comfort food. Though I have to say I took a break from comfort food last night and made my husband and I a salad for dinner. Just was in the mood for fresh ingredients and keeping it simple. This dish has a few steps but isn’t overly complicated and lends itself easily to making it your own if you wish. I changed it a bit, no surprise. 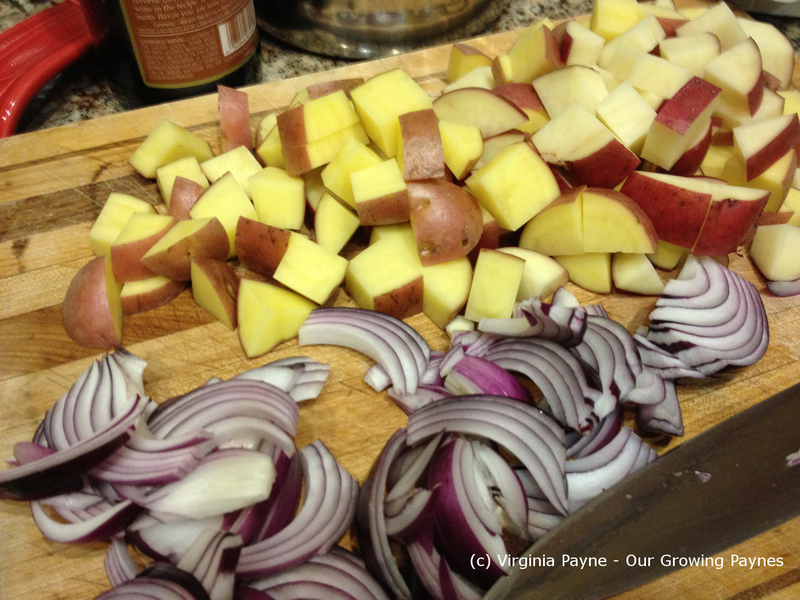 Cube 4-5 medium to large potatoes and half an onion. 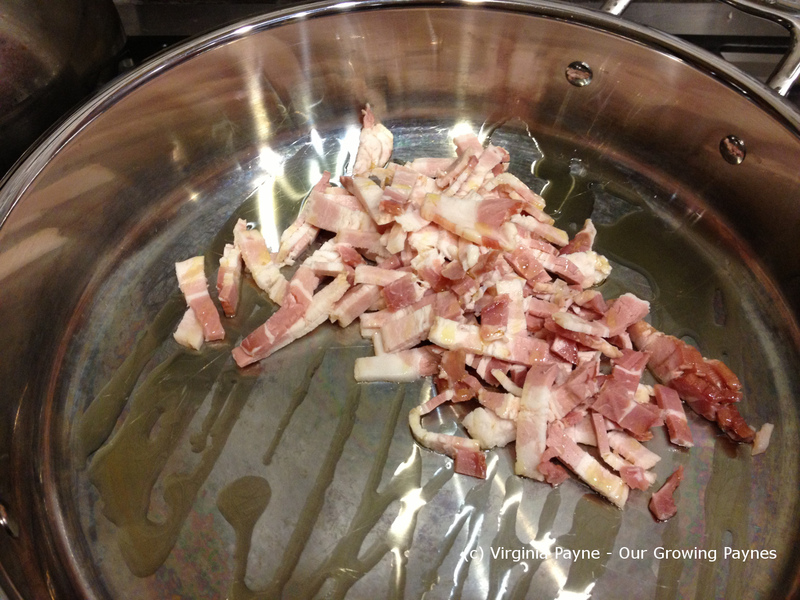 Take 4-5 slices of bacon and slice into strips and render them in a skillet with a bit of olive oil. 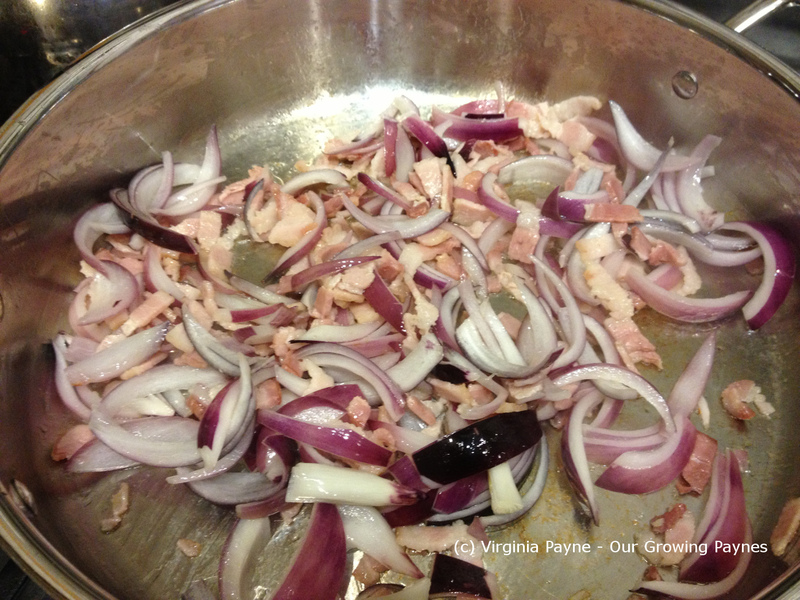 When the bacon is half way cooked add the onions to soften. Then add a cup of turkey or chicken stock and 1/2 a cup or so of marsala wine. Add some fresh thyme. The recipe I found said to just use it for decoration. I wanted the flavour. Add the potatoes, cover and simmer until the potatoes soften a bit. 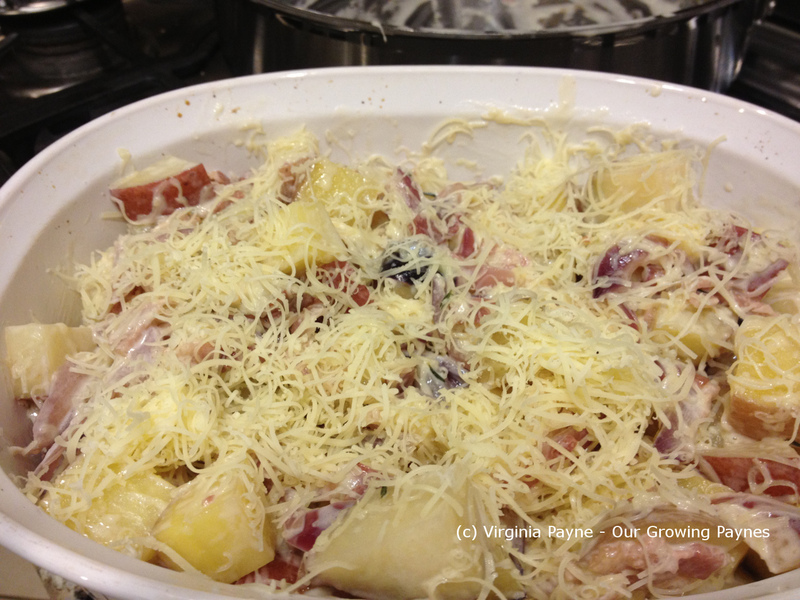 In a baking dish add half the mixture and cover with cheese. Then add the rest of the potatoes and cover with cheese. I used Jarlsberg for this. The recipe called for 250g of cheese. Which my husband was kind enough to grate and measure out. Turned out to be a huge amount. In total I probably only used about 150g and it was a lot of cheese. Cover and bake until the potatoes are soft and tender. Uncover to brown. I found some Brussels Sprouts for my husband and daughter and sauteed in olive oil until browned a bit. For my daughter and me, I found a fabulous piece of Scottish salmon. I kept that simple and just used salt and pepper with some lemon and thyme. Oh it was lovely. It all went down a treat and the potatoes were really good as leftovers. Made for some great lunches this week. This entry was posted in French Recipes and tagged baking, cooking, dinner, food, french, french cooking, Onions, potatoes, tartiflette, thyme. Bookmark the permalink. Beautiful! One day make it with reblochon – it’s even better, if you can imagine that! That’s not always easy to find round here. We can be a bit limited. But yes I’d love to try it. I keep forgetting that site! I should try to make some. I don’t think there is a more comforting dish than one made with potatoes and cheese. Great stories from your daughter! Oh I’d love to be there right now! Looks divine! My friend and I made a tartine for the first time last weekend, but yours looks even better. So I was wondering. I am officially working with an agent to create a new cookbook. We are submitting the proposal and when we get a publisher I was wondering if you would be interested in testing recipes. It isn’t that glamorous and it doesn’t pay anything but you would get a credit in the book. Also I value your opinion and would love feedback on any recipes you would consider doing. This is such an exciting time for us and I am so pumped to see how this goes! Tell Olivia thanks again for being on the show she was great! I would definitely be interested. I’ll shoot you an email. Can’t wait to see the show! The tartiflette is more Swiss than French, although Promenade Claire is right, the French who live in Savoie and Haute Savoie make it, too. 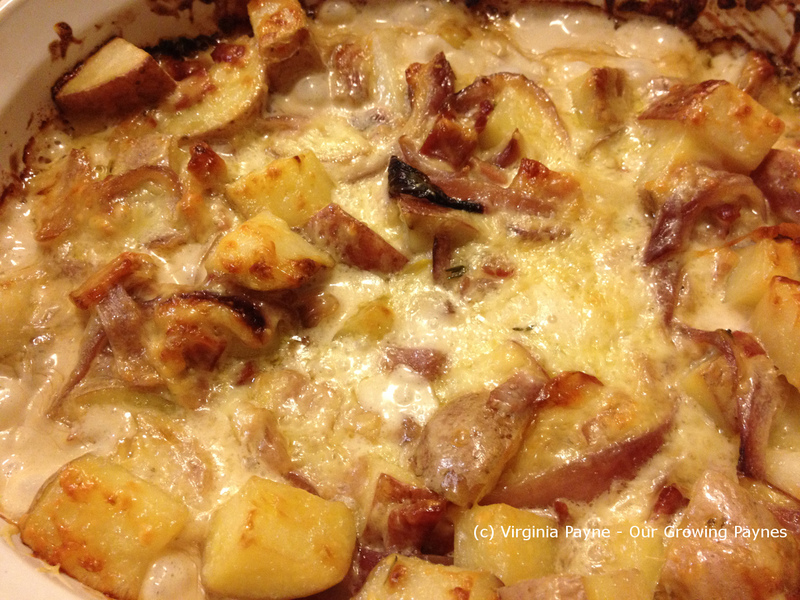 The more typical French potato gratin doesn’t use bacon. Merci! However, tartiflette DOES have bacon in it. 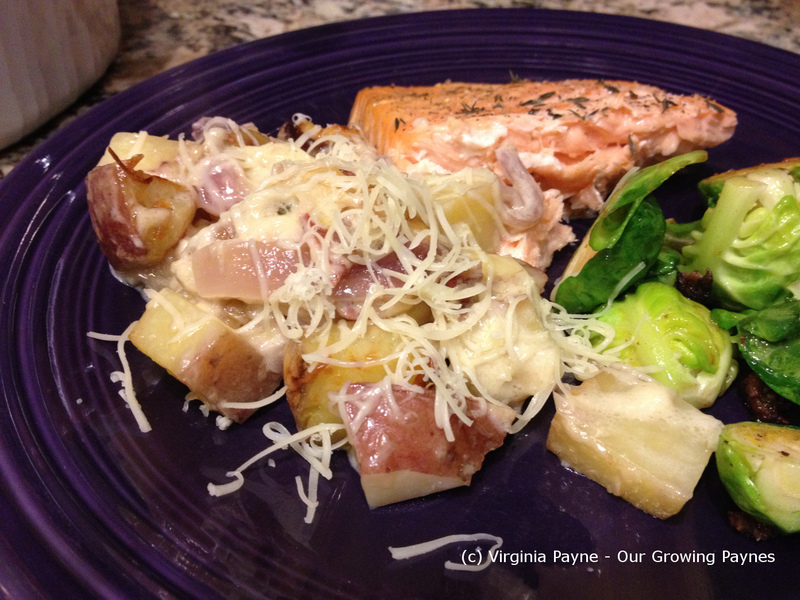 Nothing beats salmon and potatoes. Lovely dish! They do pair well together! I’d give the kids credit if they cooked that. Excellent dish. And the cool thing? They could if we let them. I should let them. Then it would be even better, less effort! I’m pinning this – already thinking ahead for the Holidays! !